The sweet, rich deliciousness we all love is no longer just good_it can be really, really good for you. We set out to reinvent the most awe-inspiring, over-the-top, incredible chocolate experience ever: the truffle. Given that signature creamy center by mixing cacao with the superfood coconut oil, its the perfect compliment for antioxidant-rich dark chocolate. 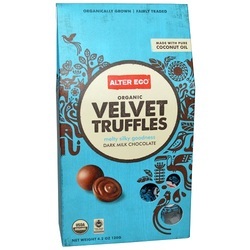 The rich dark milk chocolate of the Dark Velvet Truffle reflects the rainforest from which it hails. Acopagro sits at the edge of the Peruvian Amazon, where the worldÍs richest soil and the shade of the forest canopy create an ideal environment for native cacao.